"Delicious stuffed baked potatoes are perfect for a quick and easy weeknight meal!" Preheat oven to 400 degrees F (200 degrees C). Place rack in the center of the oven. Arrange potatoes on a baking sheet. Bake until easily pierced with a fork, 50 minutes to an hour. Heat butter and olive oil in skillet over medium heat. Saute mushrooms until they begin to soften and brown. Add spinach; cook and stir until spinach is wilted, 3 to 4 minutes. Stir in the Classico(R) Fresh Creamy Alfredo Sauce. Bring to a simmer and cook about 5 minutes to slightly thicken the sauce. Cut a slit in the potatoes and squeeze the sides to loosen the flesh. 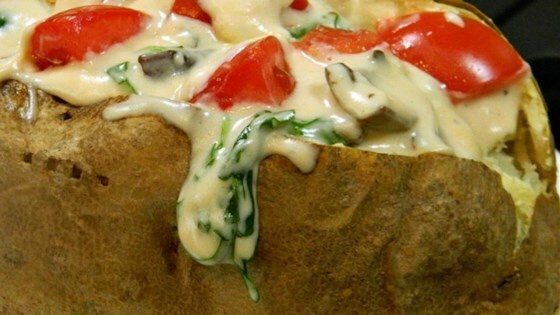 To serve, pour some of the creamy spinach-mushroom sauce into and over the potato. Sprinkle with chopped tomatoes. Yummy!! This was really good, it made a quick and easy lunch to pull together really fast. I will make this again for sure, soon. I love anything with Alfredo sauce! I love the twist on your average baked potato. It was like combining spinach dip and a baked potato. YUMMY! We added some fresh bacon bits and my carnivore husband and sons LOVED it!!!! This was fun to make and I thought it a nice break from "the usual", I did add bacon. My husband wasn't as excited as I was, hence the 4 stars.